Blackjack is considered to be one of the most complicated games to play, so many professional players share their gaming experience and knowledge to help others. This is how was the basic blackjack strategy created with such a helpful blackjacks strategy chart! If players want to become real blackjack gurus, they have to learn how to play blackjack and then master their skills constantly by practicing online, playing with skilled players and also reading blackjack books or watching the educational movies on this subject. But no one wants to lose a lot during their learning, of course. That is why it is recommended to make use of basic strategies which contain sets of the best moves, which may be made by players. Those moves guide were created by professional players, who played blackjack for a long period of time and understood the dependence of the card which have been dealt already and cards, which are still in the shoe. Those strategies were developed according to the hands that players have. There are special basic strategies for hard and soft hands. But there is also one more type of blackjack hand – hand where two cards are of the same rank. In this situation players should use the Strategy for Splitting Pairs. Here is presented the basic strategy when playing blackjack with a hand that consists of a pair. This is also called the splitting pairs strategy. 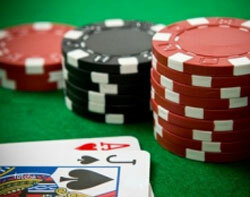 It is advised to split pairs of 2s, 3s or 7s if the dealer's card is from 2 to 7. In other cases it is advised to hit, as there is a high possibility of the dealer to go bust. It is advised to split a pair of 4s only if the dealer's card is 5 or 6. In any other cases it is always advised to hit, as the hand of 8 in total gives players great chances to get closer to 21 when hitting. In this case the pair of 6s is advised to be split as the dealer's card from 2 to 6 can make him go bust. Pairs of 8s and Aces should always be split as the hands total 16 or 12 are considered to be the worst as the risk of going bust is very high. In this case if the dealer's cards are from 2 to 6, he is more likely to go bust and a player has better opportunity to win his/her bet. Having 18 in total means that in case of hitting, the probability of losing is very high and in case of standing the chances of winning are not high either, that is why the best option would be to split in the hope of better cards for each hand. It is advised to stand as the player's hand of 18 in total is more likely to beat the dealer's hand if the first card is 7, K or Ace. The hand of 10 or 20 is a gift for any blackjack player, so it is not wise to split them.